You need this tool. The Oscillating Multi Tool is today's handiest go-to tool for a wide variety of tasks and will quickly become your favorite because of it's useful versatility. With the availability of a huge assortment of aftermarket accessories ( made by many manufacturers and available at any local home improvement store) , you can cut, sand, scrape all of your workshop projects. Kit comes with flush cut wood saw blade, radial saw blade, bi-metal flush cut blade, and triangular sander. Perfect for quick repairs around the home and shop - I find a good hot glue gun is especially useful for making quick or temporary jigs and fixtures where quick setting times are very useful. 100 watts of power makes this a serious workshop tool at an affordable price. Uses standard 7/16" glue sticks, available everywhere. BS12 12 pack, 7/16" Glue sticks $ 6.19 BS12 Glue Gun Sticks - 12 pk. If you only have one vise in your shop, this should be the one. This unique vise swivels a full 360 degrees and then locks in place when the jaw is tightened. Can also be mounted sideways for additional versatility. Precision cast jaws are 3 1/2" wide and 2 1/8" high. Opens to 5". The holes in the jaws allow the mounting of custom wood or leather, non-marring liners. Weighs a hefty 19 pounds. Solidly cast 9 pound Mini Anvil is perfect hobby size for setting rivets and snaps and light shaping and flattening. Obviously, if you're doing forging, you're going to need one of those 100 pound deals, but this will suffice for the vast majority of your shop needs. Polished face measures 5 1/2" x 2, 4" high, 3" horn . Has holes in the base for handy bench mounting. ( I mounted mine on a 2 x 6 and use clamps to hold it to the bench when I need it ). 7 Piece File Set: General all-purpose set includes 8" half round, 1/4" x 5 1/2" and 3/8" x 10" round files, 6" and 10" flat files, 1/4" x 8" square file, and 8" triangular. All have comfortable, high impact plastic handles . The 10 Piece Needle File Set has comfortable vinyl grips on all and includes 10 profile shapes: round, half round, flat, triangular, knife edge, square and oval, all of the basic shapes you'll need for any workshop shaping choir. Perfect for "fine tuning" the slots on guards for a precision fit. Tungsten carbide tip marks hard materials including hardened steel, ceramics and glass. 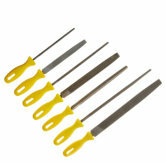 Perfect for marking patterns on steel blades that you're going to be shaping or cutting. 6" convenient pocket size, Ultra-sharp scriber point reverses for safety and is replaceable. A very indispensable tool. Flexible Belt Technology creates a superior convex cutting edge on your knife. 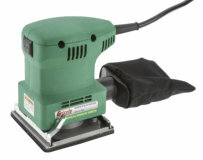 The Combo Sharpener uses a �" x 10" premium 3M� abrasive belt � engineered for cool sharpening and long life. The abrasive is designed and intended for metal grinding applications and will sharpen any type of blade steel without over-heating your blade. 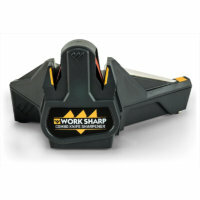 The sharpener uses precise 25� angle guides for both sharpening and honing. The innovative Tapered Ceramic Rod will hone every knife you own to a razor-sharp edge, and will sharpen most any size serration. 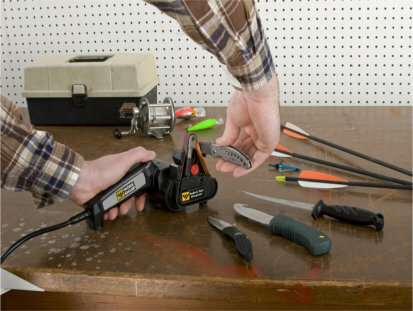 You can now successfully sharpen all your serrated knives with a single, easy to use tool.